Pension George v Santorini, Řecko: Zarezervujte nyní! In the event of a reduction in group numbers, differing from the original number of guests booked, the 1st night will be charged at the rate of the original number - unless we are given 72 hours advance notice. For group bookings, we request a security deposit of the cost of the 1st nights stay. Recommended by 6 independent tourist guides - ' Frommers ', ' Le Guide Du Routard', 'Rough Guide ', 'Kykladen', ' Marco Polo' and ' Michael Muellers Santorini'. The pension is owned and run by Santorinian George Halaris, his English wife and their two bi-lingual daughters, who will do their utmost to help you enjoy your stay and see the best of Santorini. Located in the traditional village of Karterados in the middle of the island, it is a good location for touring around Santorini and is close enough to the busy capital town of Fira without having all the hustle and bustle. It's just a 15 minute walk into Fira, and a 10 minute bus ride to the main beach. There are car & moped rental offices, coffee bars, tavernas, travel offices and mini-markets, plus a laundry and a bakery all very close by. We have 24 rooms each fitted with private en-suite bathroom, a safe box , a fridge and air conditioning and / or a kitchen and T.V. We also have some apartments that can accommodate 2 to 5 people. There is free WI- FI access. Breakfast is available on request - served on the terrace or outdoor courtyard. 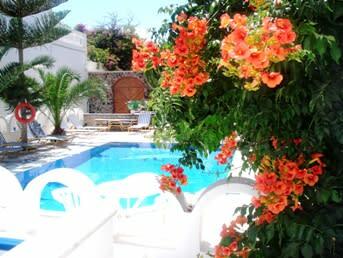 The pension is surrounded by flowers and exotic plants, and the swimming pool is set amid a small garden.